Today, for the second time this year, I had someone pull out a camera to take a picture of what was happening in class (see post about the Physics Dance Party). We started our unit on electricity and magnetism today, so we did some simple charge experiments – it’s pretty easy to transfer some electrons to a balloon by rubbing it on a wool sweater, and then that balloon will stick to your sweater, to the wall etc. After doing a quick demonstration and doing some actual physics (I swear my class isn’t just some weird crazyfest) we had a contest to see who could get a balloon to stick to the wall for the longest only using electrical charge. 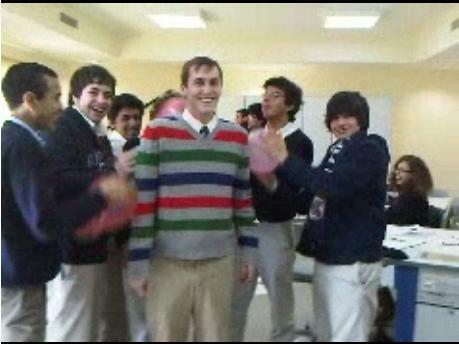 Their schools sweaters didn’t work too well (probably made of some fake synthetic crap) so the class bunched around me and gave me a 13-person balloon massage. Good times. Earlier in the class, we were talking about electricity and how Benjamin Franklin named the charges positive/negative and that this was completely arbitrary – I said he could have named them the opposite, or named them red and blue, really anything. At this point, one my strangest but funniest students – a kid who’s not fond of the idea of homework, doesn’t seem to care when he gets bad grades – piped up with ZERO hesitation and shouted “Yeah, or Rodinkh and Gingikh!” What? Yeah, sure I guess he could have named them rodinkh and gingikh. I thought that meant something in Arabic that I didn’t know (because he used some Arabic letters in there, like the “Kha”), but I saw the same look of befuddlement on the other students’ faces. Turns out he just decided to give positive and negative completely random names, and these rolled off his tongue as a pair like “salt and pepper” or “hugs and kisses” or “snakes and planes”. We wrote them up on the board and now that class has decided that we are going to use rodinkh (رودنخ) and gingikh (جنجخ) for the names of our charges. Posted on January 27, 2010, in Physics, Teaching. Bookmark the permalink. 1 Comment. i’m an arabic sensai. it means “poops in the pants”.